Willie and I have been waiting for a while for the clouds to come back to California so we can head back to the coast and get some coastal seascapes. The weather this week has been pretty rainy and we saw that Thursday the storms would end and there'd be the perfect 30-35% cloud coverage! We also noticed there'd be a high tide and high surf. We had some ideas on where we wanted to go that would take advantage of high tide/high surf without fear of death. We brought all our gear, extra clothes, food, rope, and some other fix-ins so we could head down to Davenport (near Santa Cruz) and get some of the first coastal sunset shots of the 2011 season. When we left Willie's place it was still raining. By the time we got to the coast, 45 minutes later, the clouds had *disappeared*! How rude! 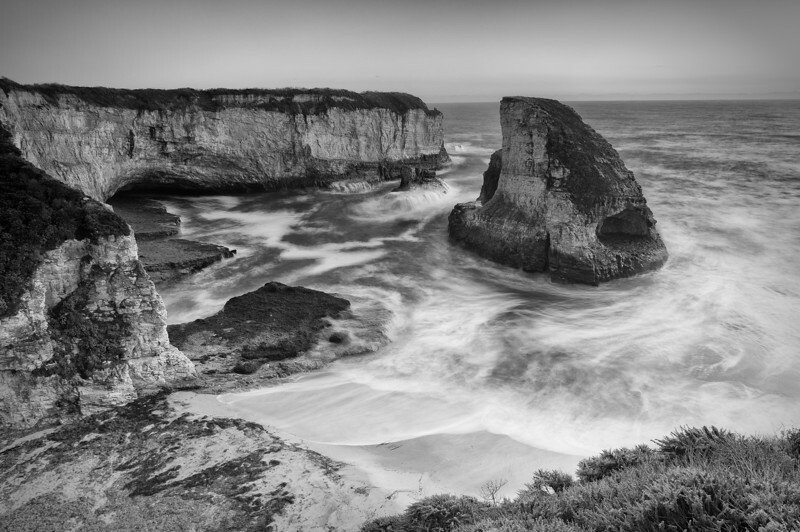 Our initial thought was to go to the Davenport "Channel" (nice photograph by Jim Patterson here) but when we got there we noticed that the waves were *so* high and so big that we'd prob die. We gave up on the channel and high tailed it back to the car. At this point there literally NO clouds in the sky at all facing west (the sunset). We figured we'd head on over to Shark Fin Cove, since it was close and we were running out of time, there were a couple clouds south of us, and Shark Fin looks south in the best composition. We got to Shark Fin, setup, and clicked away. The sky was completely boring so I decided it would be Black and White day. Nikon D300s w/Nikkor 17-35mm f/2.8 ED-IF AF-S: 17mm, f/14, 3 sec, ISO 100, Tripod B+W F-Pro Circular Polarizer, Hitech 0.9 + 0.6 ND Soft Grad No HDR! I used the 2 grad filters as if they were just normal ND filters so I could slow the shutter down a bit more than without em. Willie and I have been waiting for a while for the clouds to come back to California so we can head back to the coast and get some coastal seascapes. The weather this week has been pretty rainy and we saw that Thursday the storms would end and there'd be the perfect 30-35% cloud coverage! We also noticed there'd be a high tide and high surf. We had some ideas on where we wanted to go that would take advantage of high tide/high surf without fear of death. We brought all our gear, extra clothes, food, rope, and some other fix-ins so we could head down to Davenport (near Santa Cruz) and get some of the first coastal sunset shots of the 2011 season. When we left Willie's place it was still raining. By the time we got to the coast, 45 minutes later, the clouds had *disappeared*! How rude! 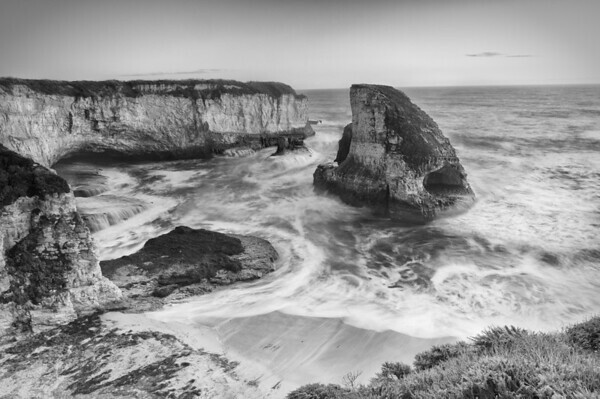 Our initial thought was to go to the Davenport "Channel" (nice photograph by Jim Patterson here) but when we got there we noticed that the waves were *so* high and so big that we'd prob die. We gave up on the channel and high tailed it back to the car. At this point there literally NO clouds in the sky at all facing west (the sunset). We figured we'd head on over to Shark Fin Cove, since it was close and we were running out of time, there were a couple clouds south of us, and Shark Fin looks south in the best composition. We got to Shark Fin, setup, and clicked away. The sky was completely boring so I decided it would be Black and White day. Nikon D300s w/Nikkor 17-35mm f/2.8 ED-IF AF-S: 17mm, f/10, 4 sec, ISO 100, Tripod B+W F-Pro Circular Polarizer, Hitech 0.9 + 0.6 ND Soft Grad No HDR! I used the 2 grad filters as if they were just normal ND filters so I could slow the shutter down a bit more than without em.